While wolf recovery was the focus of her early work, Schadler’s attention shifted to the Eastern Coyote when she moved to New England in the 1980s. She purchased a sheep farm with pre-existing coyote problems and, using coexistence strategies and common sense, successfully raised sheep for 22 years. Schadler is now the representative for Project Coyote in New Hampshire and Vermont, and a science adviser to the Northeast Wolf Coalition. She divides her time between teaching and working on her book “Becoming Wolf.” Between presentations on coyotes and wolves, she can be found at camp in northern New Hampshire researching coyote feeding patterns or leading trips into Ontario to track wolves. Howling From the Mountain in NH: A young moose, probably just booted out of camp by his mother, wallowed in a swamp while a curious but imprudent male photographer moved among the reeds between the moose and Route 16. I pulled over and stopped to watch this pair. HOWLING FROM THE MOUNTAIN: Coyote expert Chris Schadler shares her passion for coyotes and wildlife on InDepthNH.org. Howling from the Mountain: There is nothing in the world like walking down a woodland trail with no apparent wolf sign only to see that on the return trip, wolves, hiding just off the trail, had tracked us and veered off when they sensed our return. Howling from the Mountain writer Christine Schadler wrote a song and sang it to accompany this week’s column. Single male unmated coyote will travel for companionship. Medium build, thick gray coat, athletic and proven hunter. Hopeless romantic and alpha wannabe seeks female as an equal. A real SNAG (Sensitive New Age Guy) for the right type. On a recent sleepless night, curled up in front of a wood fire with a tedious book saved particularly for such occasions, the crack and hiss of the fire was interrupted by a more disturbing crunch and scurry. 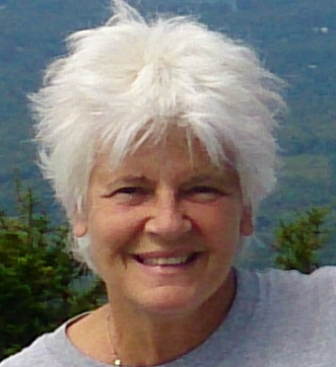 Author and educator Christine Schadler explores her passion for coyotes and wildlife in a new column for InDepthNH.org called Howling from the Mountain.